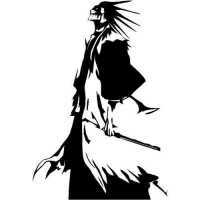 Kenpachi Zaraki Manga Anime graphic decals / stickers. Kenpachi has a wild and aggressive appearance, fitting with his personality. He wears his captain's jacket without sleeves, and with a more ragged look to it (he acquired his captain's jacket from the previous 11th Division captain, whom he defeated and killed in a duel). He styles his hair into spikes with bells at the tips and wears a special eye patch on his right eye created by the 12th Division to absorb the bulk of his power. Both of these are meant to give enemies an advantage so that he can have even fights with weaker opponents. He has a huge scar on the left side of his face (He apparently had this same scar around the time he found Yachiru). He is also one of the tallest characters in Bleach, towering at 202 cm (approx. 6 ft 7½ in). This is slightly taller than Yasutora Sado and almost double the height of his lieutenant, Yachiru Kusajishi. His stature is often exaggerated even more for dramatic purposes. Size of decal 203mm wide x 300mm high.